Omniquad has intercepted a wave of fraudulant email notifications purporting to be from the FedEx courier service. Its aprearance and contents are almost identical to the genuine email notification from FedEx, so it is difficult to recognize it as fraud unless you know what to look out for. 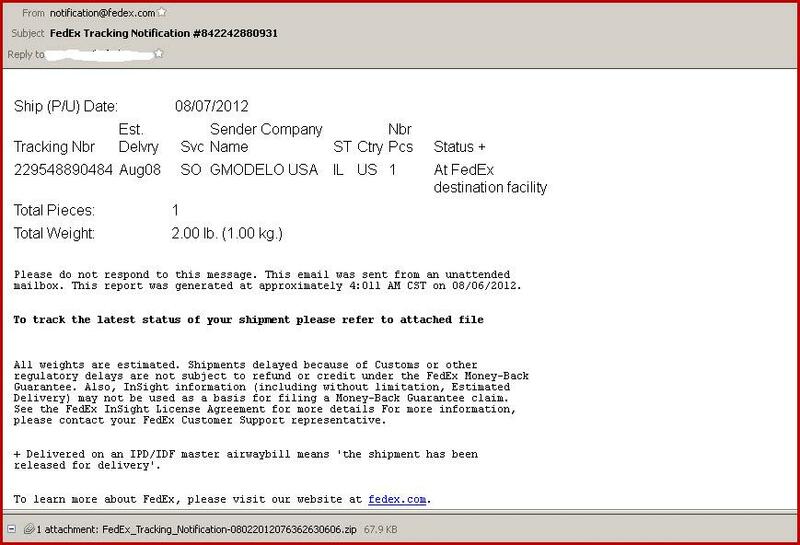 The message contains shipment details such as shipment date, tracking number to make it appear more credible and lure the victim to open the attachment. However, the attached ZIP file contains an .EXE file which we have detected as W32/Trojan3.DXR. We have seen that the attackers regularly keep changing the subject filed in this latest campaign like FedEx shipment notification, FedEx tracking notification #XXXXX , FedEx email notification #XXXXX (where ‘XXXX’ is a random number). They probably do this to try avoid email filters, but nevertheless this is not enough to fool commercial email filtering solutions such as Omniquad’s Mailwall Remote, as attachments are scanned for malware such as Trojans, along with message bodies, subject headings, etc. You should never open email attachments, click on links embedded in your email, supply personal or confidential information unless you are 100% sure that the email is legitimate. Do not respond to the emails from unknown person or organization. FedEx or any other similar services do not include attachments with tracking updates. « Lottery Email Scam: “You have won a large amount of money!” – Really? God help us………. Pls can anyone even show me how these emails look like? Hi there, I am glad you asked! FedEx website has a FedEx Customer Protection Center with updated information about scams, so it is worth checking. This is the most recent from 15th January, Fedex Holiday Scam Alert. I got one of these last week. I don’t remember if I opened the attachment or not. If i did, what should I do? Hi Elisabeth, we cannot advice on any individual case. If in doubt, it is always best to err on the side of caution, update your antivirus signatures (or download a good antivirus if you dont have one installed already. There are many good consumer products out there) and run antivirus on your pc. Yes, received one … should I forward it anywhere for tracking source of e-mail?